Colleges and universities play an important role in training competent and ethical future academic and business leaders. In today’s global business environment, with volatile worldwide capital markets and eroded investor confidence in corporate accountability, the demand for effective corporate governance and ethical conduct in ensuring reliable financial information is higher than before. 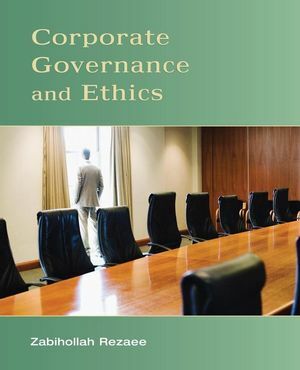 This book is intended to develop an awareness and understanding of the main themes, perspectives, frameworks, concepts, and issues pertaining to corporate governance and business ethics from historical, global, institutional, commercial, best practices, and regulatory perspectives. Zabihollah Rezaee is the Thompson-Hill Chair of Excellence and Professor of Accountancy at the University of Memphis. He holds CPA, CFE, CMA, CIA, and CGFM certifications. He is the author of Financial Institutions, Valuations, Mergers and Acquisitions and Financial Statement Fraud: Prevention and Detection and has published more than 135 articles in a variety of accounting and business journals. Chapter pedagogy: each chapter contains Chapter objectives, summaries, essential terms, objective questions, discussion questions, essays, and cases.